How SEMrush Helps You to Get More Traffic? Hello to all BloggDesk, Today we are going to share one of the most famous and valuable Blogging Tool which is used by almost every Pro Bloggers in the world, and you must be looking for the perfect blogging tool that can fulfill your all blogging needs such as Keyword Research, Checking Referring Domains, Checking Backlinks, Checking Organic Keywords and much more. The best thing we love about Semrush Tool is that, with Semrush you can find High CPC Keywords and via those keywords you can easily start profitable niche sites and make money with that site with high profits. So today we are going to share an in-depth review of semrush tool, so you can examine whether this tool is made for you or not, as we already mention that all the Pro Bloggers and Digital marketers use this tool to track their success rate of blogs and websites, so you can also take advantage of this tool and become one of them. If you are looking for the complete guide on Semrush Review 2019 than today all your queries will resolve because we are using it since last 1 year and we are so happy with it. Let’s understand exactly what is it? Semrush is one of the best and paid SEO tools that helps bloggers and digital marketers for doing keyword research of their competitor and analyses the site audits. These days competition is on peak and getting organic traffic is not that much easy, it takes time, research and efforts to find the high performing keywords on the web. You must be looking for the perfect solution that gives you all the profitable keywords which bring tons of traffic to your competitor’s website, than you must try Semrush tool to do this task for you, and you don’t need anything else to get success in the digital marketing industry. If you want proof than you should first know that, this tool is used by top sites in the world like Philips, PayPal, Forbes, Hyatt and much more. This tool is a perfect example of tools that bring success in your digital marketing profession. The price bracket is the most important thing in any review that must be cover for all of us, because there is nothing like perfect tool but if the tool providing valuable features + great cheap pricing than that tool is perfect for anyone because than everyone can afford that. SEMrush comes with different pricing badges with different functions such as SEMrush Pro account will cost you around $99.95/month, Guru Account will cost around $199.95/month, and you have to pay $399.95/month to use their business account that comes with more premium features. Please go through the below picture that will let you know three pricing plans and the features you got from SEMrush. There more than 1 lac people who uses SEMrush to find and analyze their competitor keywords. So why wait? 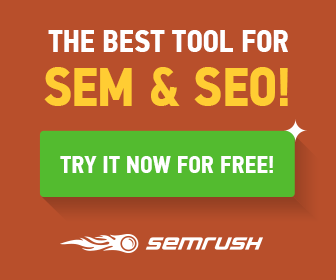 Get your hands on SEMRush today. As you guys know that, SEMrush provides you huge amount of data as we discussed above. That means, it allows you to look into all the competitors blogs to analyze plenty of things like website traffic, backlinks, best performing keywords, PPC ads and much more and you can simply follow the same strategy to improve your SEO techniques and you can get huge growth. By using this SEO tool, you will learn plenty of things such as how to optimize your posts with best performing keywords by analyzing your competitions, you can also estimate the current traffic of any website and you will be able to better understand about backlinks of your competitor’s. This SEMrush review cannot complete until we share some Pros and Cons that must be in mind of every future buyers of SEMrush. So here in this section we are going to share all the Pros and Cons of SEMrush. It’s a all in one SEO tool and you can save ton of money by using this amazing SEO tool, and you don’t need to access any other premium tools such as Ahrefs, SpyFu, Moz, Long Tail Pro etc because SEMrush provides you all the features that these tools provide you, so in simple words it is an all in one SEO tool. Finding high performing keywords that are the best thing we found on this tool. Want to know how good or bad a website is performing on Google? Well you can use their site audit feature and you will get the site issues too. The biggest con we found is, the pricing is bit high, especially for newbies. You will need to give time to this tool to get used to it. Although the interface is quite easy to use and you need to watch some of their training videos or read some tutorials to get good feel of it. Sometimes the backlinks data isn’t accurate and we found ahrefs tool good in this department. We hope you find this review of SEMrush useful while searching for best seo tool in the blogging world. If you like SEMrush Review 2019 than don’t forget to share this review post with your newbie blogger friends on social media accounts.